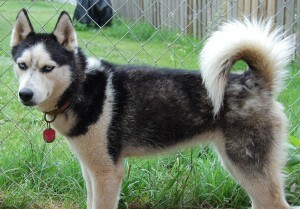 Reilly is a rather petite Siberian Husky with freckles on her nose and baby blue eyes. She is two years oldand this girl just wants to have fun! Her prior family loves her, but Reilly would become very anxious when left alone. Sadly, they were not in the position to adopt another pup as a companion for Reilly. After working with a behaviorist, they decided it would be best for Reilly to come to us. Reilly came in rather scared and not knowing what was going on. The other huskies were waiting to greet her and soon she was racing and playing with her new friends. Reilly is a sweet girl and adjusts well with other dogs. 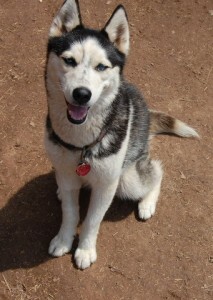 She has become a wonderful ambassador for MaPaw and now happily greets the new dogs coming in. She is wonderful with people ~ everyone is Reilly’s friend. After a good romp with the other pups, she is happy to go into her kennel and relax with a treat and a toy. Reilly will need to go to a home with another active dog. This happy girl has a shining future ~ perhaps she can share it with you!